Like a volcanic rock that broke, reveals something special inside, the Rock chair plays with the surprise effect and with contrasts. The famous Italian brand of ready-to-wear Diesel "has now won our interior with the furniture collection" Successful Living "! Stained wood type denim, black leather studded, mobile music workshop revisited, coffee table style consoles DJ ... A universe rock, industrial and vintage for a casual style and unconventional! 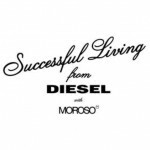 Successful Living is the first collection of furniture signed Diesel in collaboration with Moroso, the most famous company of home accessories in the design world. A union at the highest level! This collection combines the great creativity of the Diesel Creative Team with the production quality brand Moroso. Inspired from the underground music and the urban, Successful Living revolutionizes the world of furniture! The collection plays with fashion trends and perfectly reflects the spirit of Diesel: a style maverick, humorous and creative. Like a volcanic rock that broke, reveals something special inside, the Rock chair plays with the surprise effect and with contrasts. Wrinkled and dark outside. Bright, smooth and pearly inside. Outside, mysterious, serious, inside, bright and iridescent. The facets are not symmetrical, they appear to have been created like origami. The result is an intriguing and sculptural form. Rock the chair reveals a remarkable work on the matter and the development of media by powerful expressive force. The molded polyurethane seat is comfortable. The legs are made of painted wood. Rock The chair is available in black and white.